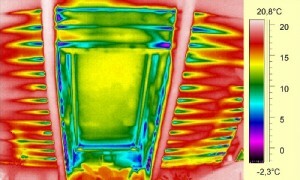 If you’re paying high heating and cooling costs, chances are you have air escaping the building envelope of your home. While insulation and R values are extremely important for the energy performance and comfortability of your home, conditioned air leaving the home is just as important. This is a problem for many reasons. First, you could be losing money. Between 15 and 30 percent of all energy costs can be traced back to preventable air leaks. Air leaks can also lead to excess moisture buildup inside your home, eventually leading to mold and other issues. To rectify it, you should have your house air sealed by a trained professional. This means that you would seal off air leakage points, which will boost energy-efficiency and reduce unnecessary heating and cooling costs. So, air sealing your home is an inexpensive way to save money, protect your investment, and prevent other long term costly problems. To tackle a leaky home, the first step is identifying the sources of the air leaks. Common problem areas include the spaces around light and plumbing fixtures, chimneys and ducting, as well as various cracks and separations that form over time. Building codes have changed over the years and there are a number of older homes that were framed with open chases and uncovered attic knee walls. These areas will consistently leak air if not addressed. Another very large source of air leakage is uninsulated or poorly insulated walls, which can account for up to 40 percent of air leaks in some homes. These issues require an assortment of solutions ranging from caulk to foam to insulation retrofitting, but each of these can be addressed by an air sealing expert. In addition to the problem of heating and cooling loss, leaking air can also present problems with excess moisture. This is most apparent with air leaks inside the home, which may allow warm, moist air to penetrate cooler areas such as attics or basements. If left unchecked, these moist air leaks can condense on exposed surfaces and provide a habitat for the growth of mold and mildew. Proper air sealing helps to prevent this from happening by restricting the flow of air, keeping moist air away from areas of your home where it may become problematic. While all homes require adequate airflow and ventilation, most homes leak far too much air than they should. One useful metric for the amount of leakage in a home is the rate of air changes per hour (ACH), which measures how long it takes for the entire volume of air inside a home to be recycled. The 2015 IECC Code states that 3.0 ACH (about three hours for a complete air change cycle) is the target. Most new construction houses have been in the 4.0-5.0 range. Many homes measure as high as 1.5 to 2.0 ACH, meaning that the air is completely changed as often as once every 30 minutes. This causes heating and cooling systems to work much harder than necessary to maintain an appropriate temperature, leading to higher energy bills and a less comfortable home. Sealing up the leaky areas will provide better energy efficiency and make for a more comfortable home. For more information about insulation, contact USI online to find a branch near you. USI believes that excellence in every step of the process and ensures timely completion and quality of service, time after time. All of our branches have air sealing experts to help consult with you.